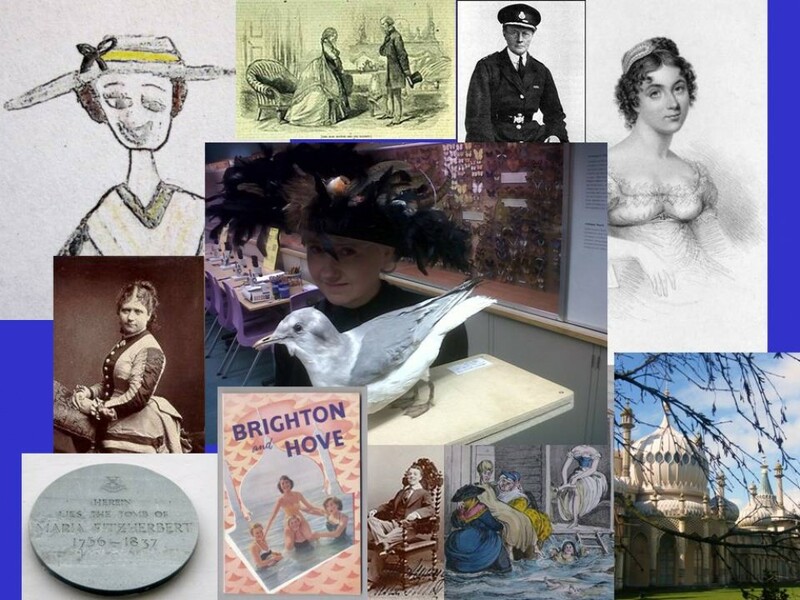 As my Notorious Women of Brighton/Kemp Town walks wind down for another year, I’ve come to realise that one of the things that make them fun for me is the people I meet. I just love to have a chatty group. Really, the noisier the better. If you want to add things, ask questions, pull me up on something you think isn’t right, scream, shout, laugh, just go ahead. There’s nothing trickier for a tour guide than a sea of blank faces giving nothing away. And I love talking to people as we move from place to place. This year I have had a very vocal dog who barked when I stopped for more than 10 minutes (a handy way of knowing when I was starting to go on a bit too long), a cabaret dancer, a synchronised swimmer, an escapologist’s assistant, a man who remembered seeing Laurel and Hardy at the Hippodrome, and a wife sales expert (of the historical nature, I should add). I enjoyed chatting to the synchronised swimmer. She told me that she goes swimming in the sea from Brighton beach every Sunday afternoon, regardless of the weather and the season. ‘With a wet suit?’ I asked. She looked at me as if I’d suggested she swim in a Mickey Mouse costume and said ‘of course not!’ Come to think of it, I think she mentioned it was her seventieth birthday this weekend. With this in mind, I thought I’d add something about a local woman, born in the Queens Park area of Brighton in 1900, who for a time was the hottest celebrity of the swimming world. Born in Freshfield Road and educated in England and Germany, Mercedes worked as a typist in London, but it’s for her feats in the water that we remember her. In 1923 she set a British women’s record of 10 hours, 45 minutes swimming the Thames. 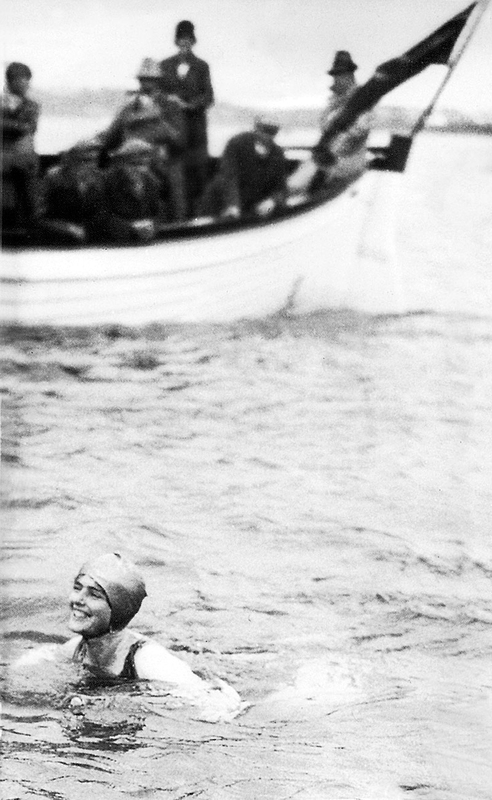 In 1927 she became the first English woman to swim the channel, setting off from Gris Nez near Calais at 2.55 on a foggy morning, arriving in England 15 hours and 15 minutes later with the water temperature never having nudged more than 15 degrees celsius (nippy when you consider the temperature in the usual swimming pool is 25 – 28) after almost being barged into by boats and lost in the fog. An odd footnote to this story is that just a few days later another woman claimed to have swum the Channel too but was shown to have cheated, leading Mercedes to attempt it a second time. She didn’t quite manage it this time but at least people believed that she was the genuine article. Just a year later she became the first person ever to swim the Straits of Gibraltar from Tarifa in Spain to Morocco. Just last year I went to southern Spain and stood on a hill behind Tarifa overlooking this exact stretch of water. Africa, 9 miles away, looks deceptively within touching distance and the stretch of sea is blue, beautiful, crammed with tankers and as choppy as hell. According to OpenWaterPedia just over 600 people have made this swim (fewer than people who’ve climbed Everest) and the average time is 4 hours, 41 minutes. Mercedes took just under 13 hours but didn’t have the energy drinks, understanding of nutrition, and knowledge of how the body works at her disposal that swimmers have today. In the different websites dedicated to swimming this stretch of water, things to beware of, as well as unpredictable and changing currents, plummeting water temperatures and sudden sea fog, include vomiting and passing out from excessive consumption of sea water, exhaust fumes from boats and accidentally swimming into oil spills and other polluted areas. Oh, and sharks. ‘So you’d better keep close to the support boats’, one website helpfully advises. Although it’s still a huge feat these days, at least swimmers have the benefit of others’ experience. As the first, Mercedes was – literally – swimming into the unknown. What possessed her?